An unexpected critical hit of the fall season, The Whale opens November 4 in Cleveland, after winning coveted Critics’ Picks endorsements from both the New York Times and the Washington Post. The film was brought here by Ohio University alumnus Eric Desatnik ('01), who joined superstars Ryan Reynolds and Scarlett Johansson as the film’s executive producers. 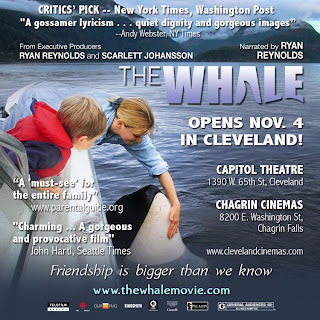 The Whale, the true story of a young killer whale who lost contact with his pod and tried to make friends with humans, runs from November 4 through November 10 in both the Capitol Theatre in Cleveland and the Chagrin Cinemas in Chagrin Falls. 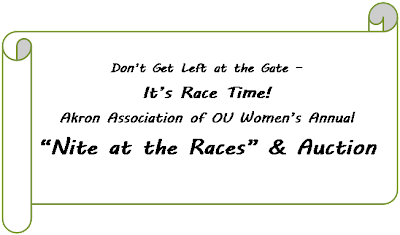 It is rated G.
The Akron Association of Ohio University Women invites you to A Night at the Races. 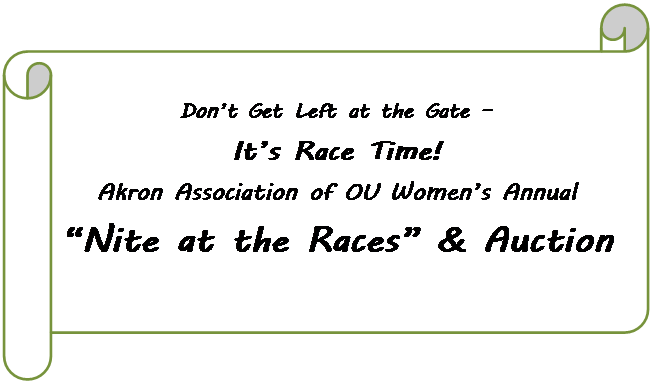 Meet a whole new group of OU alums and enjoy a fun evening together! You can own and name a horse for just $20, and there's also an auction with some great prizes. All proceeds will be used for a scholarship for a qualified local student attending Ohio University. Click here to register online through the Ohio University Alumni Association's Web site. The registration deadline is November 7. Contact Barbara Gazella at 330-686-9029. 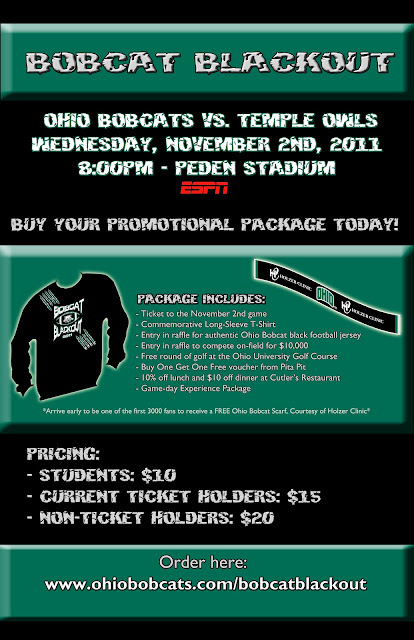 OU Athletics wants you to pack Peden Stadium to cheer on the 'Cats in a game that will be nationally televised on ESPN. The special package includes a ticket for the OU-Temple game, a commemorative t-shirt, a chance to win $10,000, and more! For more info, visit OhioBobcats.com/BobcatBlackout. The Annual Ohio University Women's Club "Mimosa" Brunch and Auction! What: Brunch, door prizes, a Chinese raffle, a silent auction, and a live auction; all money raised at the auction goes to the OUWC scholarship funds! Online: Click here to register at OhioAlumni.org. Mail: Download a registration form here. We are looking for donations for both the live auction (handcrafted items of all sorts...be creative!) and the Chinese raffle (should be new and have a retail value of over $50.00). The donation items must be collected by Wednesday, October 26. The contacts listed below are the "collectors" of the goods and are all happy to make arrangements with you for your donations. Feel free to contact whoever will be the most convenient for you. Baked goods and last-minute items will be welcome the morning of the auction. Meet up with fellow Bobcats at an upcoming Bobcat Bash or Game Watch Party! Join us at the Barley House to cheer on the 'Cats when they take on Temple. Kickoff is scheduled for 8 p.m., but come early to put your smarts to the test in the weekly trivia game. Trivia starts at 6 p.m. There is no cost associated; pay as you go. Yell "Muck Fiami" as our 'Cats defeat the lowly Redhawks! The game kicks off at 7 p.m. Enjoy food and drink specials as you cheer on the Bobcats. There is no cost associated; pay as you go. The official Web site for Homecoming 2011 is ohioalumni.org/homecoming-2011. One recent update is that the parade will be streamed on WOUB. You can find a link on "Schedule of Events > Saturday," below the parade listing. If you're not going to be in Athens this weekend, wear your green and white to our game watch party at the Harry Buffalo in Lakewood. The game starts at 3:30 on Saturday afternoon; more info is on ClevelandBobcats.com. Apply for a 2012 Freshman Scholarship! The Ohio University Women's Club of Greater Cleveland will be awarding a scholarship to a high school senior woman from the Greater Cleveland area who will be attending Ohio University as a freshman in the fall of 2012. Since 1951, more than 100 such scholarships have been awarded to OU-bound women! If you meet the above criteria and are interested in applying for this scholarship, please use the link below for the scholarship application. Applications can also be picked up from your local Greater Cleveland area high school guidance counselor or can be requested from Karen Shallcross, the OUWC Student Relations Chairperson: 216-524-0863; kshallx@prodigy.net. This scholarship can range in value from a partial scholarship, up to a full tuition scholarship, for the freshman year only. The maximum a student can receive is an amount, when considered with other awards, that totals tuition only. All scholarship applications must be postmarked no later than Saturday, February 18, 2012.